Multi-award-winning band, The Outside Track, fronted by four powerhouse women, are embarking on their fifth studio album, ‘Rise Up’. Featuring songs and tunes all by or about women, including 11 female composers, the album is an attempt to promote gender equality in the folk scene. The Outside Track want to celebrate female talent and act as strong role models for young women. Having headlined major Folk Festivals all around the world, The Outside Track have already won a multitude of fans with their high-energy performances, and this new album captures their vivacity and virtuosity. The Outside Track’s marriage of Celtic music, song and dance has been rapturously received around the world. 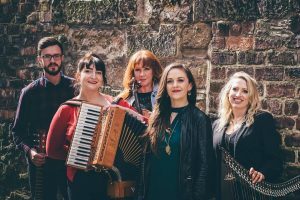 Hailing from Scotland, Ireland, and Cape Breton, its five members are united by a love of traditional music and a commitment to creating new music on this as a foundation. They blend fiddle, accordion, harp, guitar, whistle, step-dance and vocals with breathtaking vitality. Their blend of boundless energy and unmistakable joie de vivre has won them a large following around the globe. Ailie Robertson: From Edinburgh is widely regarded as one of Scotland’s leading young traditional musicians. She is a musician in the broadest sense: composer, arranger, teacher, improviser and harp virtuoso. Fiona Black: From the Highland village of Evanton, Fiona developed a love of music and dance from a young age. The Feisean movement (Feis means Gathering or Festival) provided her the opportunity to nurture her passion through learning to play the piano accordion. Michael Ferrie: Is an award-winning guitarist and composer from Callander, Scotland.